appropriate pest management options including, but not limited to, the judicious use of pesticides. 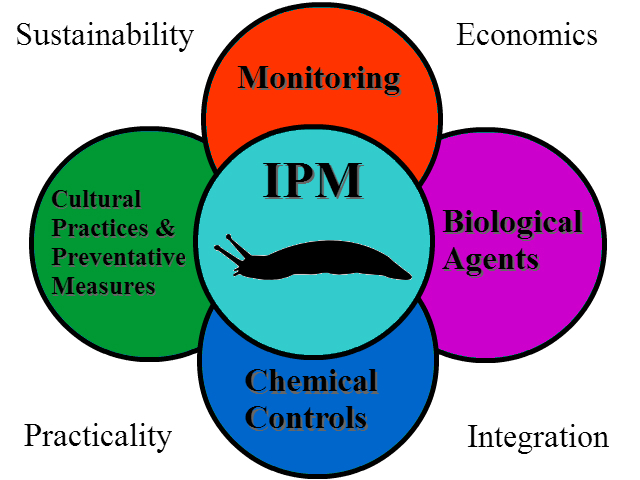 In contrast, organic food production applies many of the same concepts as IPM but limits the use of pesticides to those that are produced from natural sources, as opposed to synthetic chemicals. Many tactics keep pest populations off-balance and avoids development of resistance to pesticides. Least-toxic effective methods are used before more toxic ones whenever possible. What are the categories of tactics and specific actions included in each? Suppress pest problems by minimizing the conditions they need to live (water, shelter, food). Planting plants that are adapted to your growing conditions, planting them in the right place, giving proper attention to their water and nutritional needs and the like. Strong plants resist diseases, outgrow weeds and are less likely to succumb to insects. Prevent pest access to the host or area, or, if the pests are already present, physically removing them by some means. For example, this could mean using barriers, traps, vacuuming, mowing or tillage, depending upon the pest and situation. Use pest-resistant plant varieties developed by classical plant breeding. Recently, this category has been expanded to include genetically engineered pest resistance, such as Bt corn or potatoes. There are also special uses of genetic techniques on pests themselves, such a “sterile male” insect releases. There are many “chemicals” that are used in pest management situations, but not all chemicals are alike from the standpoint of their range of action, toxicity, or persistence in the environment. There will be more information on the classes of chemicals in the Learning to Use Tactics section, Activity Lessons from Labels. Biorational chemicals are those that are less universally toxic and target a specific aspect of pest biology. An example might be diatomaceous earth used to scratch the surface of insects to dehydrate them, or microbial pesticides that affect only a specific group of insects. There are some biorational chemical tactics that are hard to classify by toxicity or that are used together in innovative ways with other tactics. An example of this would be insect pheromones used together with sticky traps. Pheromones are the chemicals produced by insects to attract their mates, and so these substances are not toxic. But they can be used in large amounts to “confuse” the mating process or to attract insects to a trap. Other examples of such chemicals are repellants, attractants, and antifeeding agents. Regulatory control refers to the role played by government agencies in trying to stop the entry or spread of pests into an area or into the country via inspection, quarantine, destruction of infested material, and other methods.